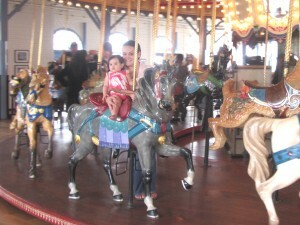 While we were on the Santa Monica pier, we were looking for a game or ride that Ke’alohi could do but she was much too small for everything. On our way out we saw the carousel and went in to see if they had an age minimum. Luckily they don’t and we were not only able to take her on there, but she could ride one of the horse if I stood next to her holding on to her.